Vanguard has announced a new set of photographic accessories to slot into its 2012 range of products, including new tripods, heads, bags and more. New tripods include the Abeo, an ultra-smooth, advanced tripod designed for enthusiast and semi-pro photographers. The strong legs promise to support a heavy load weight while still being lightweight itself. Quick-flip leg locks also enable quick setup and are tension adjustable. Other tripods also released include the Nivelo lightweight and compact tripods, while the high-end Auctus Plus tripod range has also been unveiled. Meanwhile, new bags in the Xcenior range have been announced, which include shoulder bags and rolling luggage-style cases for professional photographers. 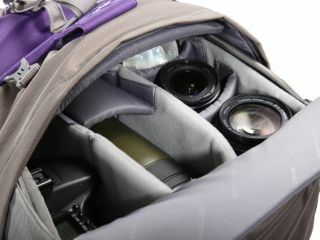 The shoulder bag boasts a large capacity and features a multi-layered interior and anti-shock bottom. The Kinray series has been inspired by birders and outdoor photographers, with the bags customisable with several removable dividers. A top of the line tripod ball head, the BBH, has also been introduced, promising accuracy, precision, convenience and ease of use. The Rapid Level System enables photographers to guide a camera to be perfectly level with the base. The GH-200 is modeled after the GH-100, with the new model supporting both standard and large zoom lenses. Finally, a new spotting scope, the Endeavour ED and new binoculars, the Spirit ED have also been introduced. For in-depth details about all the products, visit the Vanguard website.